For the environmental groups pressing a Utah wilderness lawsuit, the U.S. Supreme Court’s unanimous ruling against them on June 14 was a stunning tactical loss. But the landmark ruling has implications far beyond the narrow issue of wilderness: It limits the ability of all citizens to sue the government over how its agencies manage the entire range of natural resources. "It’s a real setback for conservation interests," says John Leshy, who was the Department of Interior’s top lawyer during the Clinton administration, and is now a professor at Hastings College of the Law in California. "It has implications across the board." The Southern Utah Wilderness Alliance filed the lawsuit against the Bureau of Land Management, an agency of the Interior Department, in 1999. The environmental law firm Earthjustice joined in. 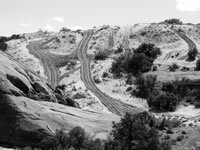 The groups charge that the BLM has not done enough to manage off-road vehicle traffic in Utah’s wilderness study areas — lands officially considered candidates for protection since the 1980s that are still awaiting congressional designation as wilderness, or "release" for other uses. Traffic has surged on several million acres of wilderness study areas in Utah, but the BLM’s responsibilities there are defined only generally. The main law for the BLM, the 1976 Federal Land and Policy Management Act, requires that wilderness study areas be managed "so as not to impair" their wilderness quality, but it allows off-road traffic to continue, as long as the land is not harmed. The BLM, which manages 23 million acres of public land in Utah, has made moves to control off-road traffic since the lawsuit was filed. Last year, the agency says, it monitored about 3,200 miles of trails, maintained 44 barricades closing trails, and rehabilitated 27 miles of former trails. Decades-old travel plans are being updated, and there is more effort to limit the traffic to existing trails. But the environmental groups say countless trails are still not even mapped, much less evaluated for impacts; they call for more closures and wider discouragement of trailblazing. And they say the land is being hammered, an argument that is still hanging around in a lower court. The portion of the lawsuit that the Bush administration’s Interior Department brought to the Supreme Court honed in on a technical, but crucial, legal question: Can citizens sue a federal agency over its lack of action? No, the court ruled, not if Congress only sets a general goal for the agency, such as "nonimpairment." That is the court’s interpretation of the 58-year-old, frequently amended Administrative Procedure Act, which spells out how citizens can sue agencies. The ruling, written by one of the most conservative Supreme Court justices, Antonin Scalia, says that allowing lawsuits over an agency’s general goals could "lead to pervasive interference with BLM’s own ordering of priorities." The ruling affirms that agencies like the BLM are "given a substantial amount of discretion" in how to carry out many goals set by Congress, says Matthew J. McKeown, a deputy solicitor for the Interior Department. And in general, McKeown says, "The courts are a really bad place to resolve natural-resource issues." But many environmentalists say court actions are necessary when the BLM drags its feet or ignores the public’s wishes. So do the attorneys general for 14 states, who filed a brief supporting the right to sue; the states claimed an interest in proper management of federal land within their boundaries, and argued that "Congress did not delegate to BLM discretion to allow impairment" of wilderness study areas. The ruling has already affected a Montana case that involves 650,000 acres of national forest wilderness-study areas, established by Congress in 1977. A federal judge in Montana ruled in 2001 that the U.S. Forest Service should not have allowed increased traffic in those areas, but that ruling has been stalled on appeal. In the wake of the Utah ruling, the Supreme Court has remanded the Montana case back to the 9th Circuit Court of Appeals for reconsideration. Among the wider repercussions, environmentalists who want to sue agencies over general congressional mandates like "protecting biodiversity and species diversity, multiple use, sustained yield — all those things are beyond (court) review now, if an agency chooses to do nothing," Leshy says. Lawsuits based on many other legal arguments and laws can still be pressed, though. Citizens can still sue agencies over lack of action, if Congress has set a specific goal that has not been met, such as a deadline. Citizens can also continue to sue over tangible agency decisions, such as logging sales and gas leases. The Supreme Court ruling is particularly staggering because the court’s liberal justices agreed with the most conservative justices in a rare 9-0 vote against the environmentalists. "The conservatives (on the Supreme Court) basically don’t like citizen suits, and they don’t like environmental plaintiffs," says Leshy. "The liberals want the agencies to get deference — they think the government does good things, and the courts should stay out of the agencies’ hair." The author is High Country News editor in the field.